It’s freezing cold outside, and has been for days. 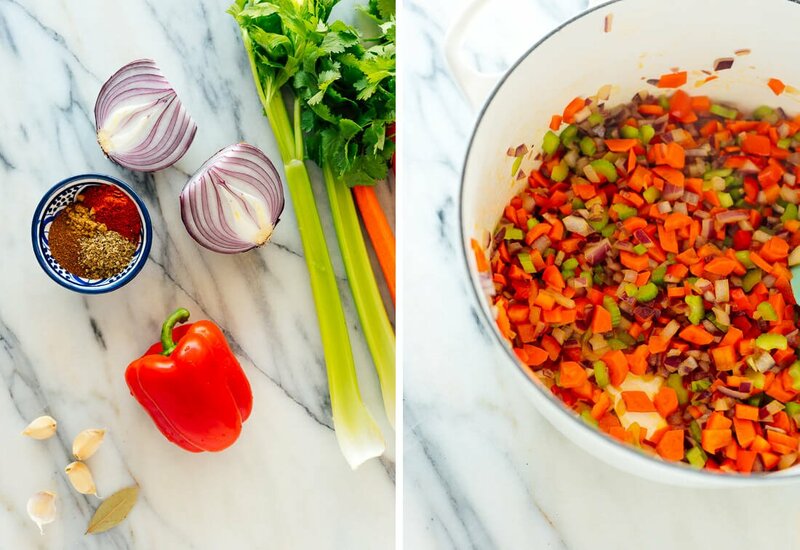 All I want to eat is cozy comfort food like this vegetarian chili recipe. It’s my favorite, and leftovers taste even better the next day. 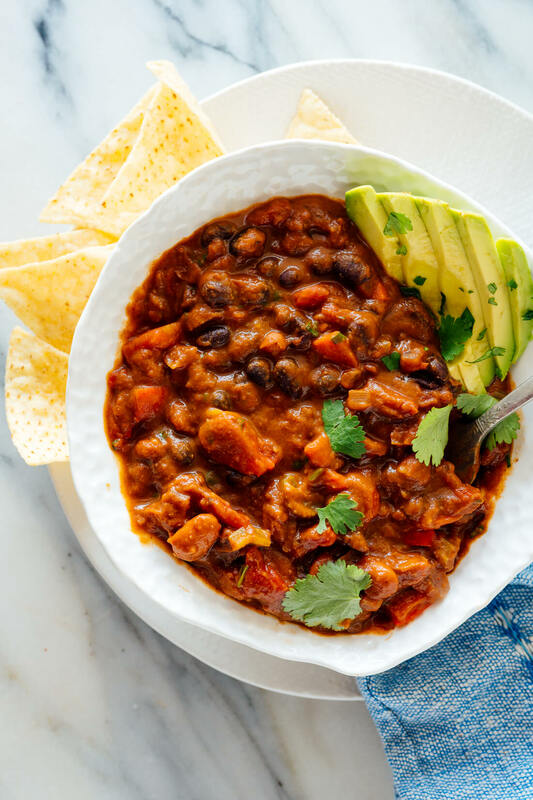 This chili is perfect for watching football games with a crowd, since it’s a hearty meatless option that carnivores will enjoy. Plus, it can be vegan and gluten free if you choose your toppings carefully. This chili will satisfy everyone. I originally published this recipe four years ago. Since then, it’s become your favorite chili recipe as well (four-hundred reviews and counting). I’ve cheered when you’ve told me that it won your chili competition, and love hearing that it’s become a staple recipe in your kitchen. Hooray! While the ingredients in this chili recipe are super basic, the flavor is anything but. Simple ingredients can taste exceptional when they start off with aromatics like onion, carrot, celery and garlic. Add traditional chili spices and some smoked paprika for an extra-savory, smoky note. 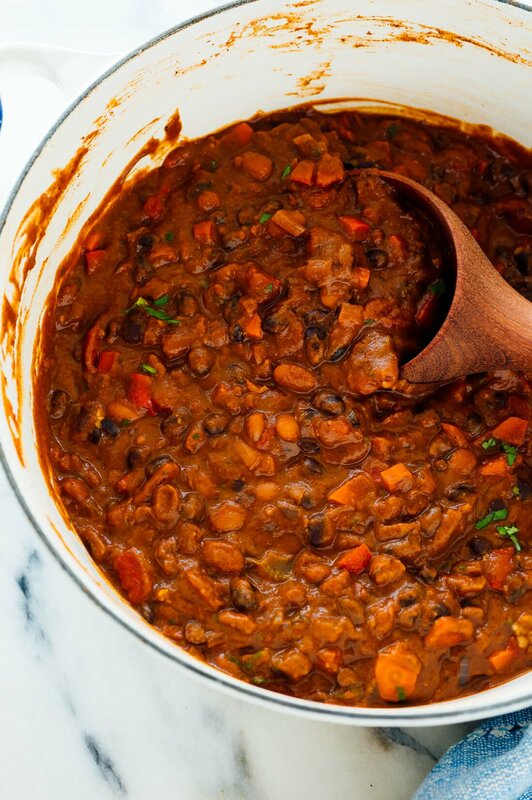 Canned beans and tomatoes contribute delicious plant-based protein and heft. Blending a small portion of the chili makes it look and taste like a chili that has been cooking all morning long, but it only needs about 30 minutes of simmering. That’s a little trick that I learned from my lentil soup, which is another cozy option for cold days. Finishing off the chili with a little splash of sherry vinegar (or lime juice) and fresh cilantro makes it taste vibrant and fresh. The vinegar offers a little acidity and complexity, and it makes all the difference. This chili is dairy free and vegan as written. You can keep it that way be choosing vegan toppings like sliced avocado and tortilla chips. 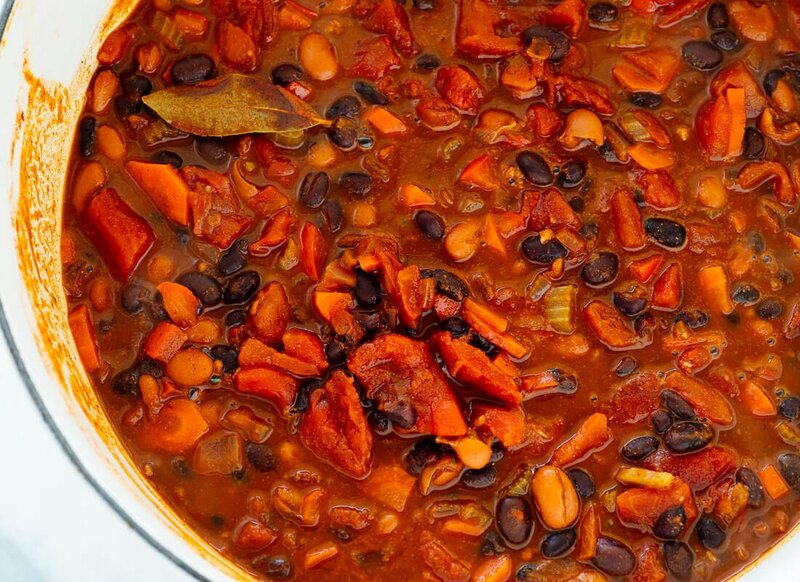 This chili makes great leftovers that keep well for four days in the refrigerator. Reheat your chili in a bowl and it’s good to go. You can also serve this chili as a protein-rich topping on nachos, baked potatoes or oven-baked fries. Stuff your burritos or quesadillas with chili. Why not? Please let me know how this chili turns out for you in the comments! I always love to hear from you. Stay warm out there, and if you love this hearty soup, be sure to check out the hearty soup recipes in my cookbook. Recipes consulted during the making of this recipe: vegetarian chili with winter vegetables (The New York Times), vegetarian chili (Saveur) and winter vegetable chili (Food and Wine). 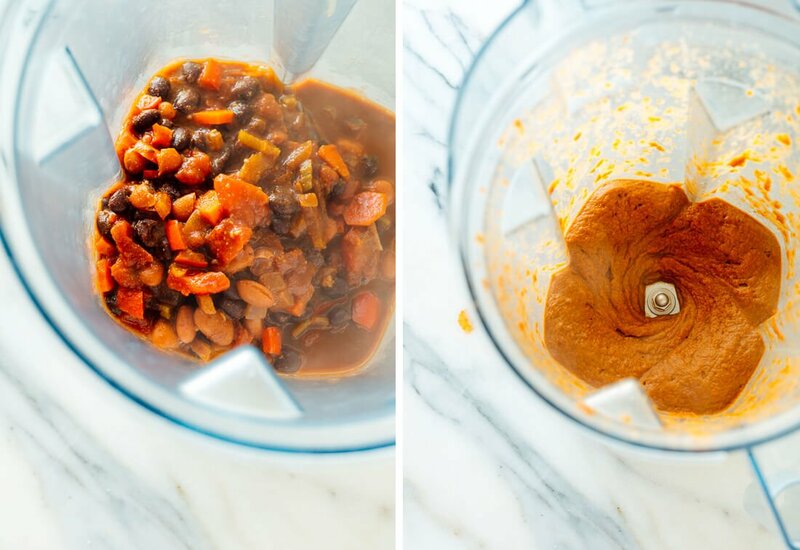 Make it vegan/dairy free: This chili recipe is vegan as written. Just be sure to choose vegan/dairy free toppings, such as avocado and tortilla chips. 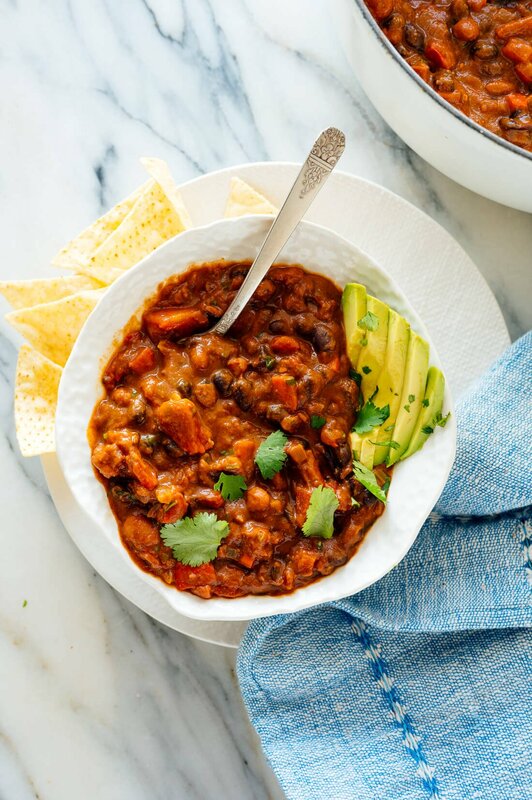 If you love this recipe: You’ll also love my butternut squash chipotle chili and sweet potato chili. 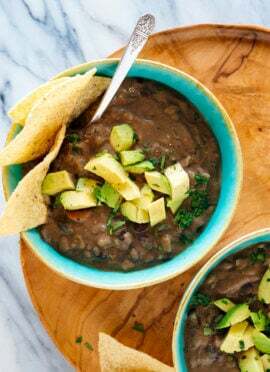 You might also enjoy my hearty lentil soup and black bean soup. *Spice note: If you are sensitive to spice or using particularly potent spices (I hear that chili powder purchased outside of the U.S. can be very hot), you might want to scale back on the spice here. Start with half of the amounts listed and add more to taste. That said, I enjoy spicy food and found this chili to be well-balanced as written. **Canned tomatoes note: I recommend Muir Glen brand—they have the best flavor and their cans are BPA-free! Great recipe – one of my regulars now. I add mushrooms for some extra body and usually add more celery and carrots than your recipe calls for. Love the smoked paprika in this! Thank you for sharing! You’re welcome, Ellen! Thanks so much for your review. I appreciate it. I never have a reason to make vegetarian chili because my vegan sister (shockingly) doesn’t eat many beans, and my family is a happy meat-eating family. My 4 kids, husband, and I have always been very happy eating meat chili. But this week I decided to try a pot of your vegetarian chili next to my meat chili. What a mistake! Yours was so full of delicious flavors! We didn’t even miss the meat! My meat chili is now dull and lifeless. You changed my husband and I over!!! I’m glad you loved it, Jenny! Perfect with Bob’s Red Mill 13 bean mix. Only had regular paprika but I will have to get some smoked for next time. Still delicious. Added some corn, and topped it with diced red onion, cheese, and sour cream. Probably my favorite veggie chili ever! during the cooking process? Thank you! I’m not big on them, but I would maybe add them during the cooking time. Thank you for such a delicious and filling recipe! Tasted so good on a cold night, and we’ll have leftovers too! SO good!! I increased the veggies and used kidney beans instead of pinto beans but kept everything else as written and I cannot stop eating it. I never would’ve thought to puree half but now I won’t make it any other way! This chili is amazing!! Didn’t change a thing in your recipe. Am making it for the second time right now and can’t wait for it to be done. Thank you. This was so delicious! I’ve honestly loved every dish I’ve made off your site… Thank you for all the healthy and delicious recipes . I’m glad you loved this, Selina! Thanks for your review. You’re welcome! I bet it was delicious in the potatoes. I appreciate the review, Amanda! Love to hear you liked it so much, James! Thanks for sharing and for your feedback. We thought this had an excellent flavor but next time i would use 1/2 of the chili powder. A great way to make this more your tastes, Marci! Thanks for the review. We had a chili cook off at work and I decided to use this recipe. It was SO SO GOOD! I won second place and TONS of compliments! Also, super easy! Definitely will be making again! Way to go, Katelyn! Congrats. Thanks so much for the review! Just made this today and all I can say is, thank you! The tip to blend a proportion of the chilli and then re add it is genius! It really makes a vegan chilli seem meaty and is going to help so much in my mission to reduce my meat consumption! Delicious and easy to make, nom nom! You’re welcome! Thanks for the review, Kate! Wonderful! Huge hit! I followed it to the tee but doubled it for my office. Will keep this recipe forever! Even shared it with my kids. How nice of you to share it, DeAnna! Thanks for the review. This is my favorite chili recipe and my whole family loves it too (including my two kids under 3). I have made it so many times for so many different people that I can’t even count! It is a good base for including ground beef or spicy chili powder depending on the crowd. Thank you. This one should freeze well! Let thaw in you refrigerator or gently warm over stove top. Delicious flavor, texture, and was so easy to make! I had no diced canned tomatoes on hand but did have one fresh tomato, a 15 oz. can of tomato sauce, tomato paste, a little extra water to get to 28 oz. and it came out very tasty. I loved the flavor even though I didn’t have a chance to get cilantro. Definitely will make again. I served it with cheddar cheese, avocado and cornbread. I’m happy you liked it! Thanks for sharing your variation, Nicole. Great flavor and texture. Don’t miss the meat at all. Will definitely be making this again. Happy to hear that, Tommy! 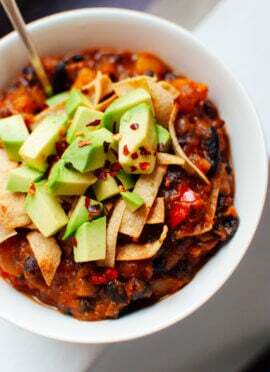 I’m always looking for great vegetarian dishes and chili is one of my favorites. After seeing the reviews last night, I decided to make it tonight for dinner. The ratings are well-deserved. It’s absolutely delicious. I only made one change and increased the vegetable broth by a cup. It didn’t dilute the flavors and gave me the texture that I prefer. Next – butternut squash chili!! I’m glad you agree with the review, Cheryl! This recipe is a keeper in our house- it is SO delicious and full of flavor. I’ve made the recipe plenty of times as written but recently started adding 1 large or 2 small diced jalepenos for an extra kick of heat. Don’t skip using the immersion blender at the end- it adds such a wonderful texture! Thank you for this recipe! 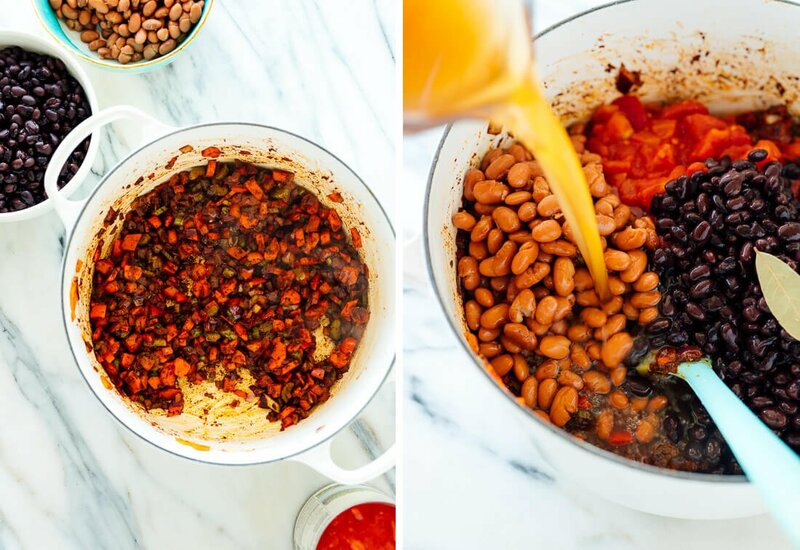 This is the best chili recipe – Ever! So easy to make and so satisfying! I made it exactly as you instructed and it was perfect! I am a fan! My wife is a vegetarian but I am not, and I’m the cook, so it’s a constant search for quality veg recipes. In her pre-veg days she was fond of chili but hadn’t had any for years so I was pleased to run across your recipe and surprised her with it last night. Whenever I prepare a new dish for her I always have it as well because it’s the best way to know how it turned out and what adjustments might be needed. We both really liked it and think it is perfect, no changes! Thank you, it has now gone into my kitchen notebook of dinners. I’m glad you both could enjoy this one, David! Such a great & basic recipe! I omit the celery and carrots for corn & top with avocado. Finally a good vegan chili! I’ve tried more veggie chili recipes than I can count. This one is excellent, and so easy. Thank you!! You’re welcome, Juli! Thanks for your review. That sounds great and such an adorable thing, too! Thanks for the review, Meera. I was on the hunt for an easy, nutritious, freezer friendly recipe. This has seriously hit the spot! Australian chilli powder is really spicy so I only used half a tablespoon and it’s still really spicy. Thank you! I hear it does have some extra kick to it! Thanks for sharing, Trish. My family loves it! No suggestions! Happy to hear that, Shayna!Thanks for the review! Awesome recipe! Made it tonight and followed it as is- and the balance of flavors and spices were perfect. I was so happy it wasn’t bland. Your recipes are always on point. I made this last night, super easy version of vegetarian chili. I used good quality canned beans (combo of black, cannellini, and kidney) and followed the recipe exactly to see if any tweaks needed for next time. Absolutely perfect, my guys gave it a big thumbs up! Enough for us to enjoy for 2 days, plus 2 containers in the freezer. Thank you you for sharing! I’m glad it got the thumbs up, Mavis. Wow, another winner from cookieandkate! This recipe is amazeballs!!! This is the first time I’ve attempted making scratch chili and I actually think it’s the best chili I’ve ever had in my life! I added 2 jalapeños for more heat but I still wanted more kick. Added habenero sauce which did the trick. I didn’t have the smoked paprika so I’m excited to try that next time. The immersion blender is genius. Thank you! This was delicioussssss my family loved it even my 12 year old granddaughter. They all want to know when I’m going to make it again. They were surprised there was no meat but oh so much flavor. Thanks for sharing, Phyllis! That’s wonderful to hear. This chili is downright delish. This was the 3rd time I’ve made it….by the book but on a whim I added about 1/3 cup adobe sauce (a little leftover sauce I was trying to use up). It really gave it a yummy punch. Not too hot, just a little more flavor. Thank you for sharing! I love to hear that! Thank you for the review, Cassie. Another winning recipe from your page! Even the spouse liked it and he is a chili snob. I used regular paprika and kidney beans instead of pinto since that is what was on hand. This may not be to everyone else’s taste, but… There was leftover chili a couple days later and it was nice and thick. I added a smidge of barbecue sauce and made an “almost Sloppy Joe” out of it. So good!!!! Chili fries would be another good use of the leftovers. Delicious :) everybody loved who tried it! Hi! Can this be made in the crock-pot? Hi Kristen! I haven’t made it in the crock pot, but I believe other readers have and liked it. I recommend searching the comments to get their tips! Excellent veggie chili. So tasty and easy to make. I let mine sit in the croc pot to simmer through the afternoon. I like the tip of using an immersion blender to thicken up the chili. Bonus, it makes the veggies less noticeable to my kids. The whole family enjoyed this! I’m happy to hear it was a hit, Christine! This is going on the weekly rotation. That’s great, Stefanie! Thank you for your review. I’m looking to scale this recipe up for a larger crowd. My best guess based on the ingredient list is that this yields about two quarts. Does that sound right? Hi Robert, I’m sorry for the late response. Yes, that sounds about right. I LOVE this recipe. I love all of the veggies and it is so hearty. Thank you for your review, Yvonne! This chili recipe is SO good!! It’s amazing how much flavor it develops in such a short time. This is my second time making it– the first time I pureed too much of the chili, but sticking to the 1.5 cups was perfection. This chili converted hubby, who until now swore he didn’t like (my) vegetarian chilis, but gave rave reviews to this one! Thank you for your review, Janelle! SO good.. so easy to make.. and beat out lots of other meaty chilis in a chili cook off yesterday! How would you make this in the crockpot? Would you recommend it that way? I love it the way it is, but I would love to be able to leave it going while I go to work! I haven’t made it in crockpot, but I believe others have. I suggest looking at the comments to see. I made this and it turned out so good! 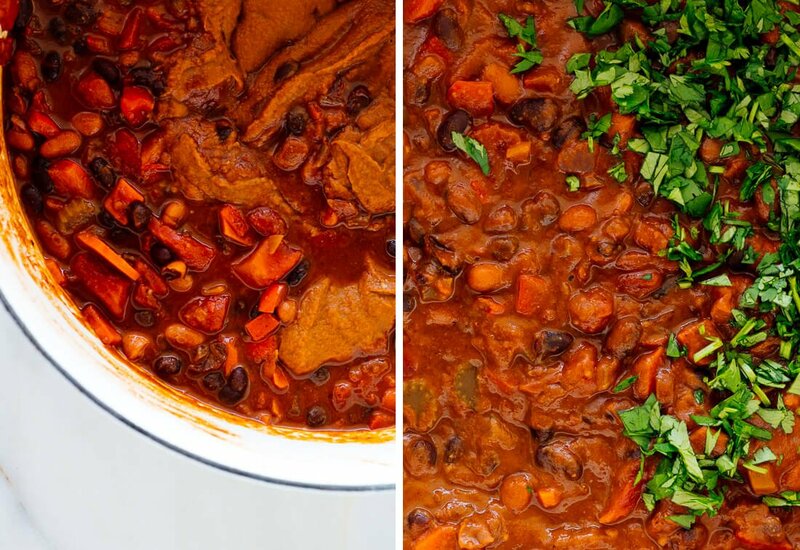 Love the simplicity and wonderful flavors that has a great chili taste. I used two tspn of lime juice, but now you have me curious about sherry vinegar so may try that next time. I left out the carrots and celery because I didn’t have any… used water not vegie broth but would like to try vegie broth next time. Also used more garlic but that is just me. Delish! They are both really great options, Michael! I’m a fan of garlic too, :) Thanks you for sharing! Delish! Have you attempted it in an instant pot? I’m keen to try and adapt this recipe for my instant pot. I haven’t, but I believe other readers have. I recommend checking the comments to see what other readers suggest. Thanks for your review, Lisa! Delicious! The only modifications I made were to use 1 tablespoon of regular chili powder and 1 tablespoon of hot Mexican chili powder. I added more cilantro and Sherry vinegar. It is absolutely wonderful and I will share this recipe with my other foodie friends. Thank you for having a food blog that is informative not cutesy. Thanks for sharing your changes, Holly! My whole family loves this chili! Especially served with fry bread Navajo taco style. 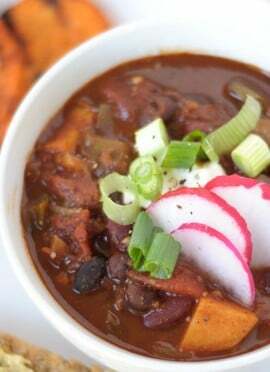 We also love to top potatoes and sweet potatoes with this yummy chili. Thanks Kate! FANTASTIC! Made this for the first time yesterday. It is so good I would happily enter it in a chili cook-off competition. The blending of the cup and a half works really well. I deviated from the recipe in two areas, only because of what I had in my fridge. Put a 3rd of a jar of left over spaghetti sauce in the dish and used chicken stock instead of water. This will be a staple of meatless Mondays for sure. You’re welcome, Grace! I’m glad you are enjoying them. I just made this. It was awesome!! I was so into it I was scraping the bottom of the bowl and almost licked the bowl Haha. Thank you for the recipe. I loved it! That’s too funny. You’re welcome, Denae! We followed your recipe to the letter and our chili was amazing. We are making it for the second time right now. Thank you so much. You’re welcome, Jackie! And yes, I hear they are very different. That is why I added a note. :) See the notes for the recipe. Thanks for your feedback! Loved this recipe! Very tasty and not spicy! The addition of vinegar or sherry or lime really makes this recipe shine. Many people have food blogs but yours is one I’ve come trust, especially when looking for a new recipe. You’ve proven reliable. Just made this and it was delicious and easy to make. It as amazing flavor and just the right amount of heat. My husband and daughter liked it too. I will be making it again. Do you have suggestion to lower the amount of sodium. I was surprised to see in the nutritional information that a serving has 45% of the daily recommended amount. Hi Julie! The nutritional information is an estimate. But, you can always get no salt added can ingredients and omit the salt. I hope this helps some! Awesomesauce! Even my meat loving husband loved it. Didn’t say it but ate one big bowl and went back for more. Love your recipies and look forward to trying more of them. I love it! Thanks for sharing, Gail. I shred the carrots & sometimes add a pound of bison. I’ve never put it through the food processor & my eight year olds love it. I forgot to add I also put a can of kidney beans in. thank you very much for the recipe. It is delicious. It’s straight forward and so easy to follow. We like spicy food but not crazy for the taste of cilantro and cumin, so I replaced them with fresh parsley and a special paprika powder that I use for goulash. We are very happy with the tase and the texture. You’re welcome, Vasile! I’m glad you found it easy to follow. Our family loves this recipe. We’ve made it several times. Thanks for a yummy dinner option. Thanks for stopping to comment, Felicia! I’m glad you loved it. I’ve made this several times for friends and family. Nice and easy to make, pretty quick too. Tasted lovely and have two more portions in the freezer.